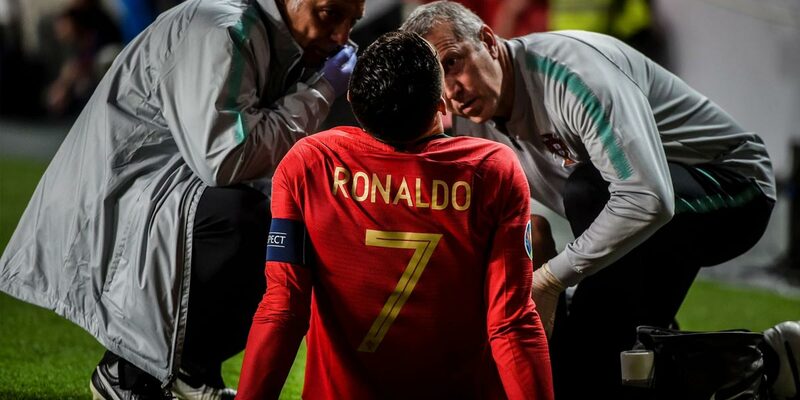 Cristiano Ronaldo suffered a thigh injury during Portugal's 1-1 draw against Serbia in the Euro 2020 football qualifier, with Fernando Santos and Tadic scoring for their respective teams. Cristiano Ronaldo went off injured as Portugal was held to a 1-1 draw by Serbia in a frantic Euro 2020 qualifier in Lisbon. A goalless draw with Ukraine in its opening Group B fixture on Friday put the pressure on Portugal heading into Monday’s encounter, and its task was made more difficult when Ronaldo appeared to suffer a hamstring injury before the half-hour mark. Beelden van de blessure van Cristiano Ronaldo. Dusan Tadic’s penalty had put Serbia ahead early on, though Portugal overcame Ronaldo’s injury to level through Danilo Pereira’s rasping 42nd-minute strike.